Older homes tend to have their share problems due to age, condition and overall wear and tear. Old floor tiling is often made from asbestos, a material that has been associated with causing various forms of cancer. As a result, floors sometimes need to be replaced by a company that specializes in asbestos removal. Old asbestos tiles may have chips, breaks and decaying areas of depreciation. 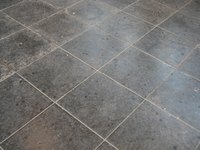 Tiles that are in good condition, however, can actually be sealed and a new floor can be put right over it. Use a hammer and a prying bar to take out baseboards on the floor. Gently pull the baseboards away from the side of the wall to prevent damaging them. Removing the baseboards allows for even application of the embossing leveler. Wipe up any accumulated dirt on the floor with a damp mop to prepare the flooring. Use a floor cleaning agent and focus on the oily areas to eliminate dirt and grime. Follow the manufacturer's instructions on the back of the embossing compound packing for proper mixing instructions. Use a wood paint stick to stir the leveler and water together to form a smooth paste. Fill a bucket with water and clean your trowel when you are applying the leveler. Pour the embossing compound onto the asbestos floor. Use the trowel to smooth the compound onto the floor tiles. The embossing leveler dries quickly so you must work fast. Completely cover the floor so that no old asbestos material can come through. Rinse the trowel in the bucket of water frequently to stop buildup of compound on the surface. The embossing compound can harden very quickly and cleaning the trowel then becomes more challenging. Let the leveler embossing fluid dry for a couple of hours. Check the manufacturer's label to verify specific drying times. Do not walk on the floor while it is drying. Once it is dry, reinstall the baseboards by hammering them into place. Hold your trowel at an angle and use long, even strokes when spreading the compound.